LONDON, England (CNN) -- Does trans-national democracy work? Or is Europe about to see a wave of new Far Right politicians and mavericks marching from obscurity to national prominence thanks to an election most voters are neglecting? Between June 4 and June 7 it could happen. 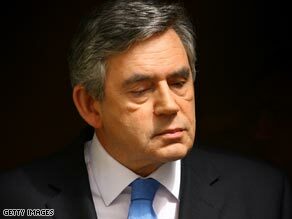 British PM Gordon Brown's Labour Party is at a historic low in the opinion polls. Since the first European Parliament election was held in 1979 the Parliament has grown significantly in power. But the more power it gets, the less interest voters seem to take in its proceedings. The latest "Euro barometer" poll found that only a third of Europe's potential electors intended to make use of their vote in a contest stretch from Portugal in the west to Romania in the east, with voting from June 4-7. Campaigning is increasing attention but there is a danger that in the latest five-yearly contest the turnout will be a record low, beneath even the 45 percent of voters who turned out in 2004 -- back in 1979 it was 62 percent. And yet the Parliament which will be elected could have more effect on the daily lives of European citizens than most of their national parliaments ever do. The problem with the European Parliament is that although it produces many of the laws which are then processed through national parliaments, most of those who bother to vote in its elections do so for reasons of national politics. The Parliament works largely on a coalition basis, making the left-right divide is less obvious than in national assemblies. Because they are not electing a government many feel free to indulge in a "protest vote" and use the European contest to punish political parties which have become unpopular in their own countries. The make-up of the next European Parliament could have a significant effect on immigration laws, environmental regulations, job promotion and the regulation of market economies. But voters won't really see those policy choices reflected in the campaigning. With elections dominated by national party labels, few will feel a sense of involvement with an individual politician -- only those in countries with "open" proportional representation (PR) systems which allow citizens to choose between different candidates from the same party is there much campaigning on personal records by higher profile candidates. Political commentators tend to look less at the policies which might be espoused by a dominant center right or center left in the elected Parliament, or the effect if a significant number of Greens were to be elected, than at what the results tell us about the popularity of national governments. This time around there will be particular interest in what happens in the European Parliament elections in Germany, where Christian Democrat Chancellor Angela Merkel and her uneasy Grand Coalition partners from the Social Democrats under Vice Chancellor Frank-Walter Steenmeier will soon be facing each other in a General Election, probably in September. The economic recession has put a huge strain on the German coalition which looks unviable in the longer term. One significant marker from the European contest will be the performance of the upwardly-mobile and anti-capitalist Left Party which looks likely to benefit from disillusion with more established parties. And that could be part of a wider pattern. In France the opposition Socialists are encouraging voters to treat the European election as a poll on President Sarkozy's record so far in the Elysee Palace. The European results will be seen as a test for the new Socialist leader Martine Aubry. But with the French tradition of street politics and the continuing appeal of radical traditions, there will be much interest in the performance of the Far Left New Anti capitalist Party led by Marxist postman Olivier Besancenot. In Bulgaria, where the country is preoccupied with crime and energy security issues, the election will be a dress rehearsal for a General Election due on July 5. Much the same applies in the Czech Republic, where the center-right government of Mirek Topolankek has been replaced by an interim administration after losing a vote of confidence. Urban rioting over the economic crisis has imperiled the ruling conservative New Democracy Party in Greece, which has only a single seat majority and the socialists of Pasok will be looking for progress there. Members of both main parties, and the Liberal Democrats, have been openly admitting their fears that voters' revulsion at the expenses spectacle and a national mood of "a plague on all your houses" will benefit fringe parties like the United Kingdom Independence Party (UKIP) and the Far Right anti-immigration British National Party (BNP). Former Europe Minister Denis MacShane said: "It was the Greens in 1989, UKIP in 2004 so perhaps in 2009 it will be the BNP." Harriet Harman, Labour's deputy leader, said: "There is a real prospect that the British National Party, with the racism and division they represent, could benefit if there is a low turn-out." Neither UKIP nor the BNP has any members in the national Parliament at Westminster but UKIP benefited strongly from a protest vote at the European Parliament elections in 2004, taking third place with 16 per cent of the vote and securing twelve seats. UKIP, however, may not be best placed to benefit from the Parliamentary expenses row. One of its elected members was convicted and jailed for benefit fraud, another is facing charges over European Parliament expenses and its leader Nigel Farage has admitted he has collected some $3 million in expenses during his time at the Parliament, claiming that he used it to benefit the party's cause. BNP leader Nick Griffin says his party will threaten "tired, corrupt old politicians." As a campaign slogan he insists "not all immigrants are terrorists but all terrorists are immigrants or their immediate descendants." In Italy Premier Silvio Berlusconi has formed yet another new party coalition -- People of Freedom (PdL) -- merging his Forza Italia with the post-fascist Allianza Nationale of Gianfranco Fini. Immigration and the controversy over the treatment of its Roma population is likely to figure in the campaign. Italian government measures like the fingerprinting of Roma have been criticized in the European Parliament. But the opposition Democrats do not seem to be achieving much traction in the European contest. If protest politics are a key theme in this election it could show up in Sweden where the new Pirate Party is said to have won the support of huge numbers of young people. They are angry at the imprisonment in April in a copyright case of four Swedes who ran the file-sharing Web site Pirate Bay. A particularly tight contest seems likely in Poland where polls show the governing center-right (PO) party of Prime Minister Donald Tusk running level with the conservative Law and Justice (PiS). Electors are not much interested though with only 17 percent of Poles saying they are likely to vote. Former Solidarity leader Lech Walesa has ruffled some feathers by attending the congress of Libertas, a pan-European Eurosceptic party which played a major part in the Irish referendum rejection of the Lisbon Treaty. The performance of Libertas, dominated by the telecoms millionaire Declan Ganley will be crucial in Ireland where the focus is on the collapse of the Celtic tiger economy under the Fianna Fail government of Brian Cowen. Leaders across the rest of Europe are hoping that the Irish government will regain enough ground to hold another referendum on the Lisbon Treaty this autumn with a different result, enabling the new European constitution to be put in place. A bad defeat for the government party and a good result for Libertas could put paid to those hopes and send Europe's constitutionalists back to the drawing board.